A text mining process using association rules generates a very large number of rules. According to experts of the domain, most of these rules basically convey a common knowledge, that is, rules which associate terms that experts may likely relate to each other. In order to focus on the result interpretation and discover new knowledge units, it is necessary to define criteria for classifying the extracted rules. Most of the rule classification methods are based on numerical quality measures. In this chapter, the authors introduce two classification methods: the first one is based on a classical numerical approach, that is, using quality measures, and the other one is based on domain knowledge. They propose the second original approach in order to classify association rules according to qualitative criteria using domain model as background knowledge. Hence, they extend the classical numerical approach in an effort to combine data mining and semantic techniques for post mining and selection of association rules. The authors mined a corpus of texts in molecular biology and present the results of both approaches, compare them, and give a discussion on the benefits of taking into account a knowledge domain model of the data. From the data mining point of view, texts are complex data giving raise to interesting challenges. First, texts may be considered as weakly structured, compared with databases that rely on a predefined schema. Moreover, texts are written in natural language, carrying out implicit knowledge, and ambiguities. Hence, the representation of the content of a text is often only partial and possibly noisy. One solution for handling a text or a collection of texts in a satisfying way is to take advantage of a knowledge model of the domain of the texts, for guiding the extraction of knowledge units from the texts. In this chapter, we introduce a knowledge-based text mining process (KBTM) relying on the knowledge discovery process (KDD) defined in [Fayyad et al., 1996]. The KBTM process relies on an interactive loop, where the analyst – an expert of the text domain – controls and guides the mining process. The objective of the mining process is to enrich the knowledge model of the text domain, and, in turn, to improve the capability of the knowledge-based text mining process itself. Following a natural language processing of the texts described in [Cherfi et al., 2006], the text mining process (also denoted by TM in the following) is applied to a binary table Texts × Keyterms, and produces a set of association rules (AR in the following). The set “Keyterms” includes a set of keyterms giving a kind of summary of the content of each text. The extraction of association rules is carried out thanks to a frequent itemset algorithm (namely the Close algorithm [Pasquier et al., 1999]). Association rules show some advantages, among which the facts that AR are easily understandable and that they highlight regularities existing within the set of texts. 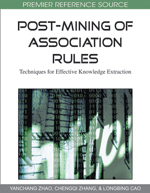 Two text mining approaches based on association rules are studied hereafter. The first approach is based on the use of statistical quality measures for classifying the extracted rules [Cherfi et al., 2006]. A set of five quality measures is introduced, each of them expressing some particular aspects of the texts: e.g. rare keyterms, functional dependencies, or probabilistic correlations between keyterms. One limitation of this approach is due to the numerical characteristics of the classification process, which takes into account the distribution of the keyterms, and ignores the semantics carried by the keyterms. By contrast, a second approach is based on a domain knowledge model of the texts which is used to classify the extracted association rules. The knowledge model is a pair (K, |) where K is a finite set of keyterms and | is a specialisation relation (i.e., a partial ordering). Hence, the quality of a rule depends on the conformity of the rule with respect to the knowledge model: a rule is interesting if it includes semantic relations that are not already known in the knowledge model. Thus, the knowledge model is used to guide the interpretation and the classification of the extracted association rules. This KBTM approach is original and relies on a qualitative approach rather than on a more classical approach based on statistical quality measures. Two experiments show that the KBTM approach gives substantial and good quality results, opening new perspectives in the difficult field of text mining. The objective of these experiments is to show how far our proposed Conformity measure is consistent with the text mining task in a specific domain (here molecular biology). This chapter is organised as follows. Firstly, we introduce the context of association rule extraction for text mining, and we present and discuss an example, based on statistical quality measures. Then, we introduce the principles of the KBTM process. We analyse thanks to an example –the same as in the first part of the chapter – the KBTM process for the so-called simple and complex extracted AR. The following section sets up an experiment and a qualitative analysis based on real-world collection of texts with the help of an analyst. The AR are classified according to the conformity measure, in contrast with five statistical measure classifications. We continue the chapter with a discussion on the benefits of the KBTM approach, and we mention some related work. The chapter ends with a conclusion and draws future work.